Thanks to the efforts of the Kitsap Regional Library, digitized versions of World War II era issues of the Bainbridge Review, a local newspaper covering Bainbridge Island, Washington went online earlier this year. The more than 200 Japanese Americans who lived on Bainbridge were subject to the very first exclusion orders issued by the army at the end of March 1942, when they were forcibly removed to Manzanar concentration camp. 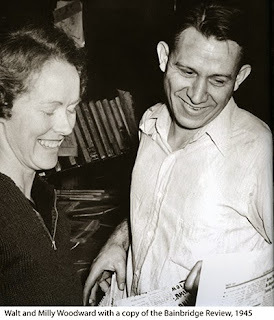 Run by the young married couple Walt (1910–2001) and Milly Woodward (1909–89), the Review was notable among West Coast newspapers for its editorial stance that largely argued for upholding the civil rights of Japanese Americans and opposing the mass incarceration. Wanting to insure that the removed Japanese Americans remained a part of the community, the Woodwards ran dispatches by Bainbridge Nisei from the concentration camps through the war years and welcomed Japanese Americans back to the island when the West Coast was reopened to them starting in 1945. The Woodwards and their brave wartime stance has been honored in recent years, with the naming of Bainbridge Island's middle school for them perhaps being most notable. The character of Arthur Chambers in Snow Falling on Cedars, the acclaimed novel by David Guterson that was later made into a Hollywood film and a play, is based on Walt Woodward. The scanning project covers the years 1941 to 1946. Scanned from microfilm and run through optical character recognition software, library volunteers then spent some 1,500 hours checking the text against the microfilm to detect and correct errors. As a result, users can search the text for key words to find relevant articles. The Bainbridge Review online archive joins a growing number of online resources on the wartime incarceration of Japanese Americans, including those in Densho's digital repository.